Some local people rose and prepared to march on the city, only to come under attack and suffer slaughter at Santry and Rathfarnham. Lord Roden and his fox-hunters took many prisoners, tied them and other suspects together on carts and put them on display in the castle-yard before hanging them on the scaffolding at Carlisle Bridge. Wade and Ledwich, two deserters from Lord Elys corps, were publically hanged on Queens Bridge on May 26 and the bodies of James Byrne and James Keely displayed in the castle-yard. The horrors of civil war had started and would engulf every corner of the country. The outrages, merciless cruelties and atrocities by the Orange yeomanry, military and magistrates would ignite the flame of revenge and play a major part throughout the insurrection. The crimes of the rebels were on the same scale, now seen to be carried out in retaliation for these terrible events. A large group of rebels entered the town of Dunshaughlin in county Meath and searched for arms in a small barrack without success. They were informed the arms had been moved into the house of a Rev. Neilson who lived nearby. A volley of shots were fired at the windows after which the rebels rushed inside and killed Neilson, his brother-in-law and a gardener, then proceeded to plunder the house and collect arms. Another party, commanded by Thomas Atkinson and Thomas Connor, ransacked the house of John Bassington of Ballymacarney in Meath and stole four horses. At their court-martial, both declared they were ordered to kill all heretics and to wade in their blood. They boasted they had murdered policemen at Dunboyne and the six Fencibles who were guarding the baggage of that regiment at Clonee-bridge. The Irish sentence of life was at the time mostly reserved for murder. This differed to the ‘Bloody code of England which saw minor crimes, even been caught at night with a blackened face receive a sentence to ‘suffer death’. James appears in the census 1811 and 1814. There was no muster for the Atlas during their year of arrival. 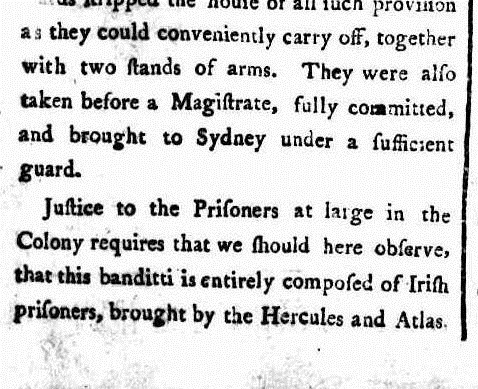 The Sydney gazette And New South Wales Advertiser, in its first edition published on Saturday March 5, 1803, informed the colony that this banditti is entirely composed of Irish prisoners brought by the Hercules and the Atlas. 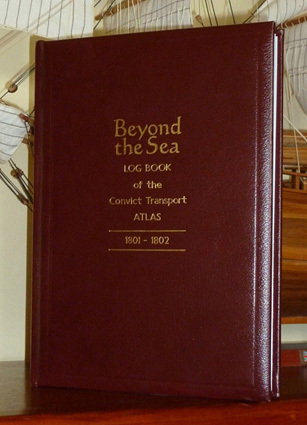 Authorities, including Governor King, were very suspicious of the Atlas I and the Hercules convicts and later those from the second Atlas that arrived on October 30, 1802. They had every right to be concerned. 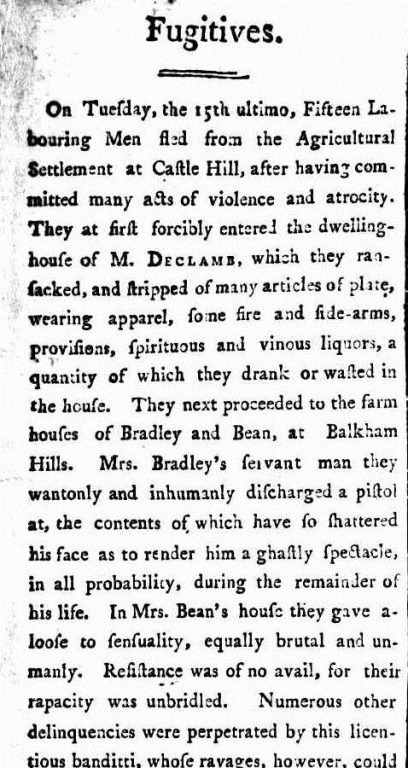 After all many had actively participated in the 1798 Rebellion, a deadly mutiny on the Hercules and a large number of those sentenced to life had committed terrible murders and other crimes of violence. It was a chilly winter morning and as a fog was starting to lift from the waters of Sydney Harbour the convicts from the Atlas who were considered able to work were marched up the dusty road from the wharf and into the gaol yard in Sydney Town. Each convict had with him bedding, clothes and his personal effects. Clothes were the most valuable item they possessed; they had economic value and could be used to trade for food, liquor and tobacco. The Slop clothing mostly consisted of a jacket, one pair of trousers, and a shirt or duck frock. Other items included a blanket, a cap, an ivory comb, six needles, stockings and a pair of shoes (often not made for the left or right foot). If lucky a pair of socks were included, if not a length of rag was bound in-between the toe and around the foot to relieve the pain and make walking at least bearable. This become known as the toe-rag. Females were given, in addition to the mens allowance, a handkerchief and a shift, and three yards of flannel in lieu of a petticoat. Once assembled in the main yard they were mustered and formed into lines before the Chief Superintendent of convicts. Most of the convicts were of dark, ruddy to pale and sallow complexion with black or dark brown hair, hazel eyes and under 6 feet (183 cm) tall. Some had been delivered from the hulk Supply which was anchored in the harbour for the purpose of cleaning their bodies, review and distribution of clothes. 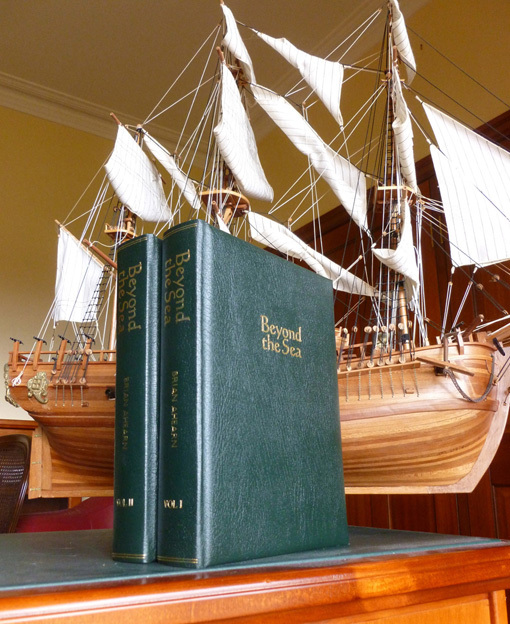 In August my book-books will be published covering Irish history, the1798 rebellion, trials, voyage of the Atlas and the Hercules, the assignments and the times in which the convicts lived. The history of the colony is covered in detail. Naturally, my family (Murtagh and Michael Ahern) is a major part. it covers their murder of the Boland family in Limerick and trials. Separate to the books will be a reproduction of the Atlas log. The Atlas arrived at 2pm on July 6, 1802. The book is in two volumes of 1,200 pages and includes many never before published documents and illustrations collected over fifteen years. Ireland’s genealogy experts join forces to provide Irish ancestry info | Irish News and Politics spanning the US, Ireland and the World | IrishCentral. via Ireland’s genealogy experts join forces to provide Irish ancestry info | Irish News and Politics spanning the US, Ireland and the World | IrishCentral. 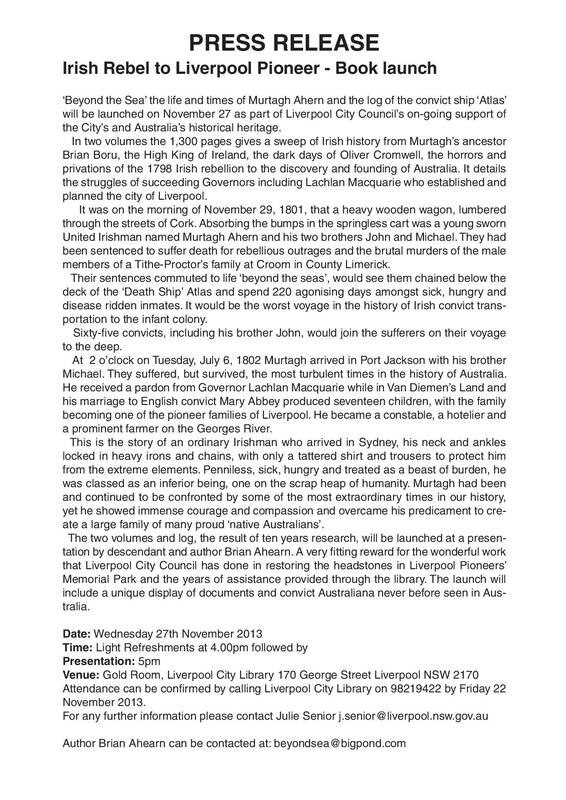 Irish Convicts to NSW by Peter Mayberry. 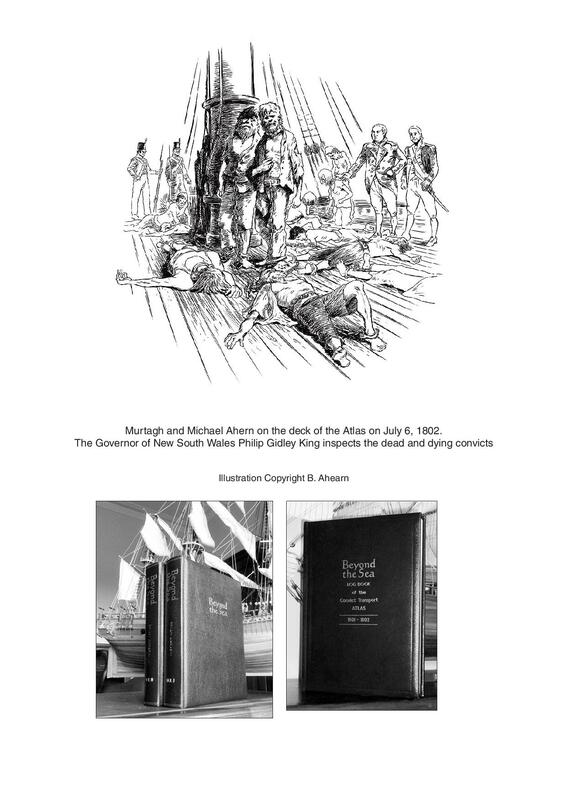 via Irish Convicts to NSW by Peter Mayberry. ‘Desperate and Diabolical’ by Ruan O’Donnell. via ‘Desperate and Diabolical’ by Ruan O’Donnell. Execution at Castle-Hill. (1803, October 2). 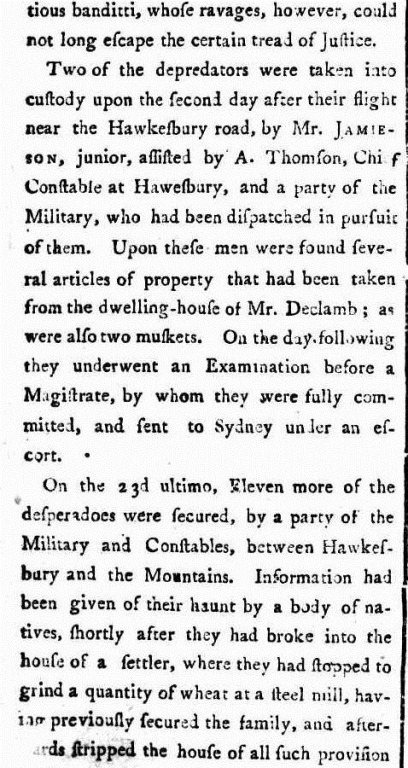 The Sydney Gazette and New South Wales Advertiser (NSW : 1803 – 1842), p. 3. Under Wolfe Tone, the United Irishmen (who consisted of Protestants and Catholics alike) declared their belief in a peaceful future for Ireland in which Protestants and Catholics could live together in peace and with equality. They wanted to set up a French-styled democratic republic in Ireland, which was independent of Britain. They quickly gained support, although some, most notably the newly-formed Orange Order which was set up to preserve loyalty to the monarchy, were against them. via History of Ireland 1789 – 1800: The United Irishmen and the 1798 Rebellion. Irish Rebellion of 1798 – Wikipedia, the free encyclopedia. THE IRISH REBELS 1800-1806–ANN MORAN. This database contains details of Irish convicts who were transported to New South Wales in the period 1788 – 1849. Rebel remnants of the 1798 and 1803 Irish Rebellions were transported to NSW during the period 1800 – 1806. Ask About Ireland is your place to find answers about Ireland. Our countryside, our heritage, the way we work and play. Here you’ll have unique access to new information, rare images and documents from Irish public libraries, museums and archives. It brings the Ireland of the past alive and makes you more aware of the Ireland of today. Go on to find out more from your local library, museum & archive. 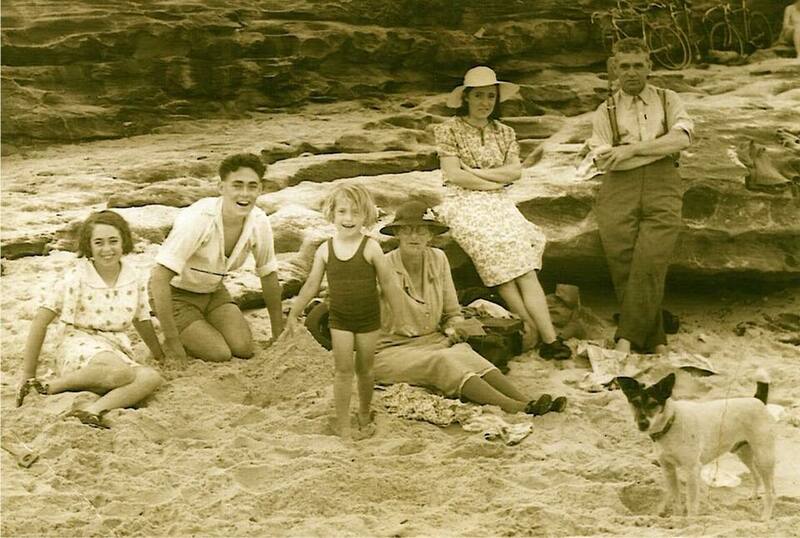 LINK SUPPLIED ON THE SUTHERLAND SHIRE GROUPS SITE.